Whatever problems you’re having with your tablet, Phone Ninja has the experience and the components to complete expert tablet repairs. So Call us or Drop-in today to our Perth locations. Like smartphones, tablets work via a touch screen that’s adhered to your LCD screen. However, your tablet’s touch screen can be damaged in many ways, although being dropped is the most common. Thankfully Phone Ninja can handle all of your touch screen repair needs. Tablet manufacturers tout their high-resolution tablet screens as major selling points, but LCD panels are fragile, and can be easily damaged. 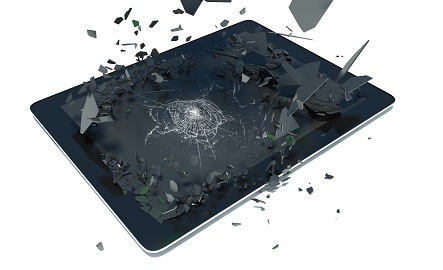 Dropping your tablet even from a low height can result in complete screen breakage. That’s where Phone Ninja can help. We can replace your tablet’s screen and give you back that beautiful display. Like smartphones, tablet batteries can be subject to a number of problems. The most common is not fully charging, which drastically limits its usefulness when you’re not near an outlet. Batteries can also fail completely. Phone Ninja can offer tablet battery replacement services for all tablets. Water can easily damage your tablet, rendering it completely useless. While there are guides available that promise you can fix this problem on your own, it’s not worth the risk. You need a trusted expert when dealing with tablet water damage, and that’s what you get with Phone Ninja. Tablet computers are subject to many different problems, from failed speakers to home button failure to malfunctioning chargers ports and more. Phone Ninja has the skills, experience and components to handle all of these problems.